Well, my beloved is back in my hands after digging her out of the parent's garage! So far, I have most of the parts but am missing some bits (am going to dig and see if I missed any parts again tomorrow). 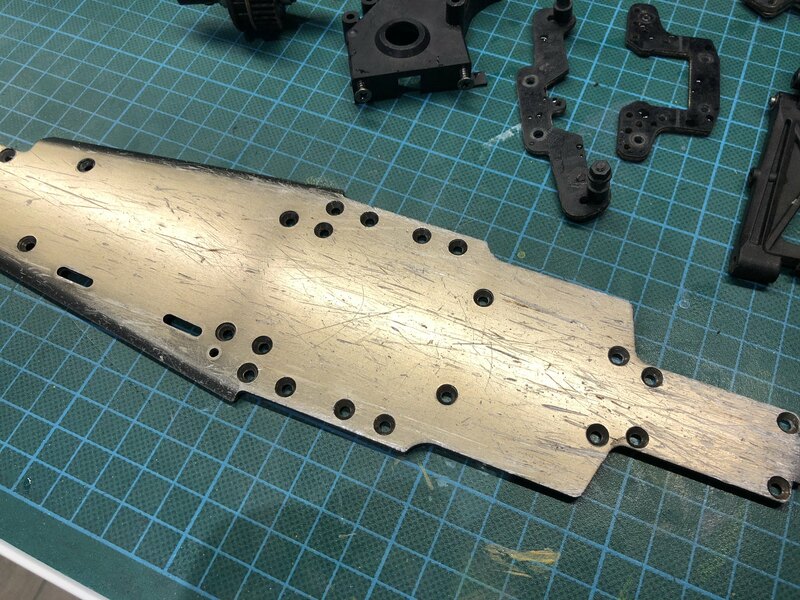 The question is, do any of the re-re Optima parts translate to the Optima Mid or are they quite different? I looked on ebay for wheels and other bits and MAN it's offensive how expensive they are... Thoughts welcomed from the Kyosho Illuminati! Mid hasn't been re-re'd, they've only done the earlier generation "chain drive" Optima (and gave it a belt upgrade option) but afaik nothing's interchangeable chassis parts wise with Mid... Mid spares are prefixed "OT" aren't they? 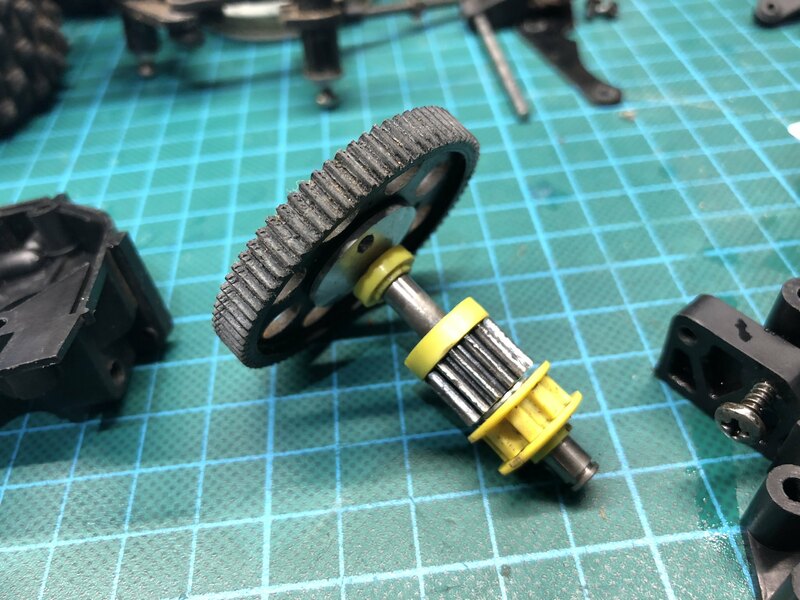 Wheels should fit fine, can use any hex hub wheel even Egress wheels. Or get newer 2.2" wheels with lots more rubber choice. 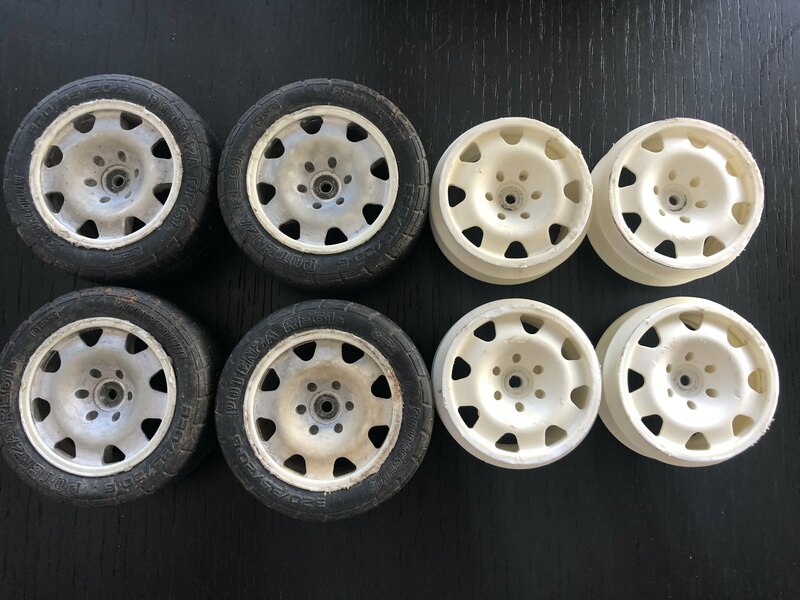 The original style Pug205T16 Mid wheels haven't been remade so they're scarce; then again even brandnew BiTD Kyosho bits were never cheap. Did you purchase your Mid in Melbourne back then? Any memories where from? 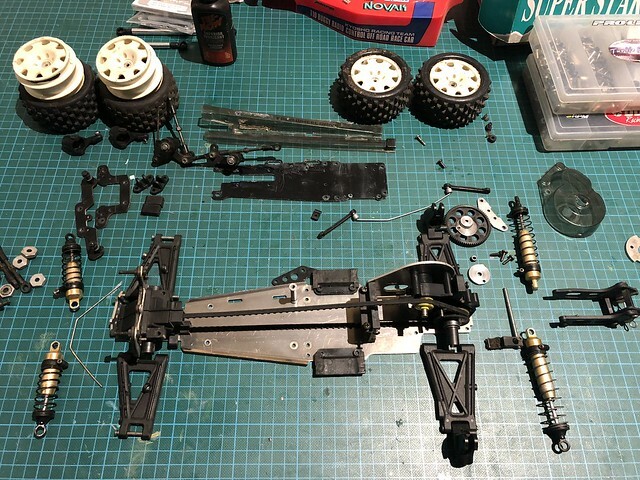 I believe all kyoshos production moulds etc, were destroyed, so the re re optima was a ground up new car that i believe doesn't even share alot of parts with the original (unlike tamiya re re). 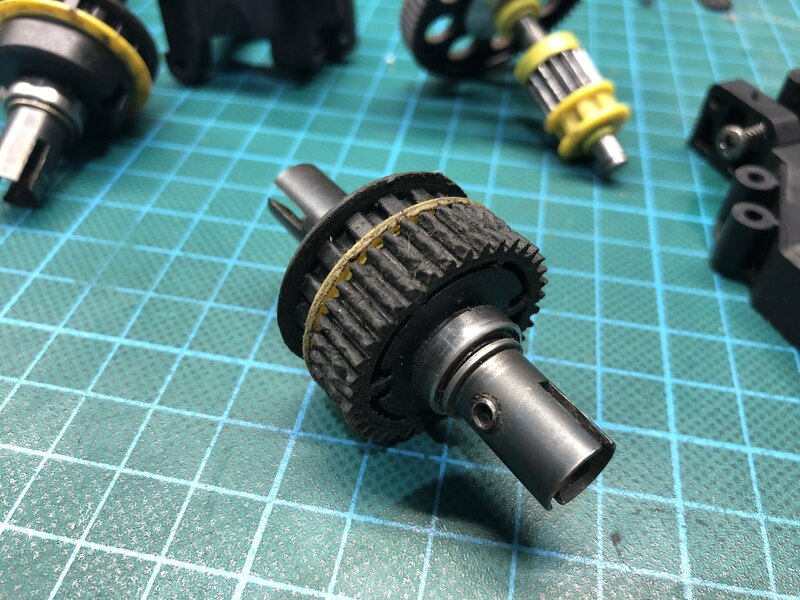 Mid wise, parts are still out there, you just need to check auction sites / sale sites on a regular basis, and things like shock towers can be bought as new in carbon fibre. Schumacher still make a selection of usable 2" tyres, if you want to keep the car looking right 🙄. Yeah, my dream is that they do re-re it, but from current timelines and best guesses that'll be in 2019 (maybe!). It was a stunning car, drove so, so well. 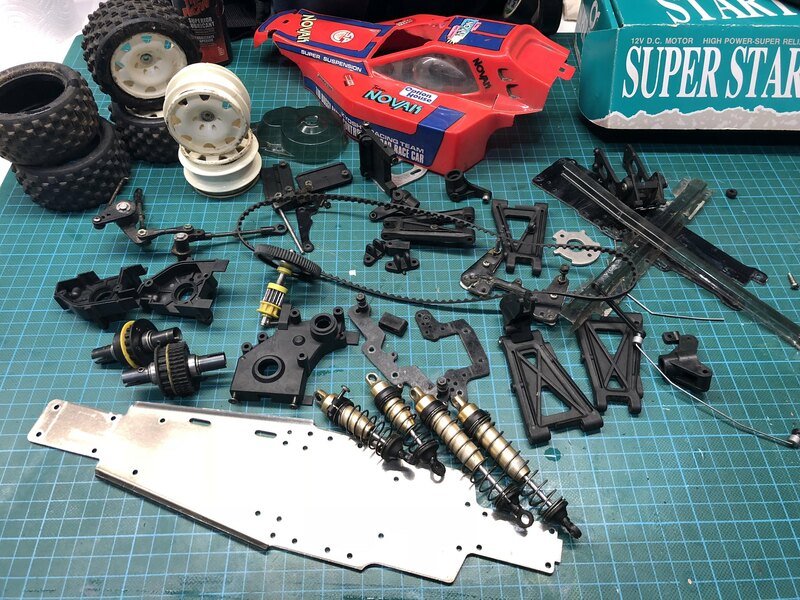 I beat it for years (as you can see) and finally took parts off it to go onto my Kyosho Nissan Skyline GTR nitro on-road. To get it to where it needs to be would probably cost $400+ I think. Hmmm, maybe the waiting game for a re-re is the only option... Gah. As for purchasing in Melbourne, yep sure did and sure do. I got it from Hobby Place on Lonsdale St. They stocked a lot more Kyosho than Hearns Hobbies did. The owner is still burnt in my mind as one of the lest welcoming and grumpiest people I've ever met. Astonishing he ran a retail store. These days I'm glad to say that Metro Hobbies is a fantastic physical store that I would have loved as a kid, their prices are awesome and they carry so much stock. Great to see. I snapped my front shock tower (frp), couldnt find any, so decided to go carbon, messaged a seller on ebay and ended up with a genuine frp for £10! (and a carbon set for the Ultima), so ask about, and you should find one. As i mentioned, schumacher still make them, and what i raced with bitd. Although marwan does repo tyres. Apologies didn't have a Google for them. They look like a great option considering price and availability of the Block Tires that I really want! Any ideas if someone has made the rims again? Also, has anyone put the rims / tires in the dishwasher for a deep clean before? Risky I know, but I've cleaned a lot of stuff over the years in there and it works well on lots of things! Funnily enough its the (blue) blocks im running on mine atm, although ive the mini spike and full spike to try now too. has anyone put the rims / tires in the dishwasher for a deep clean before? I found they came up ok with washing up liquid and a tooth brush, but they werent that bad. Awesome thanks, have reached out that eBay member, he got right back to me and has them all! I've gone hunting and have found the front bumper and the other side of the rear diff (thank God). However, I have definitely lost the rear centre gear (OT-85 Centre Gear) which is clearly critical. Apart from being extorted on eBay, any other suggestions to source one? If youre keeping it original, you'll just have to keep searching while your building, theres an alloy spur on ebay atm? I know a few people are making their own shafts using modern slippers though. Definitely not bent on all original by any stretch of the imagination, (or budget!) don't mind internal gears to be aftermarket at all! Am hunting for Thor it MIP as apparently they made them as well. 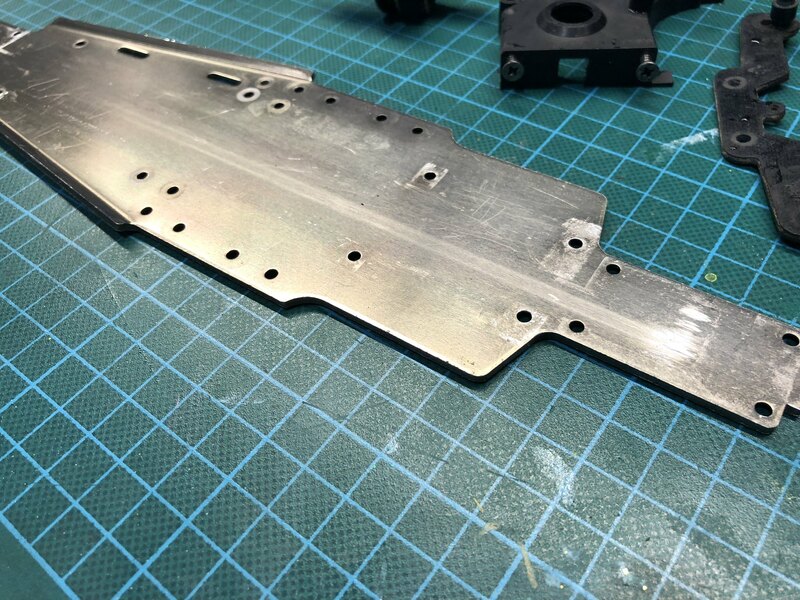 Very happy to get anything that has been made by 3D printing or aftermarket people, get's far too expensive if you want NOS, the cars just aren't worth it to me when the re-re's are only a matter of a year or so away. I've been told they're all in Matte Finish as well, i'll have to take their word for it as have never seen gloss next to them! Also, does anyone know how the heck this master got the logos on the tires? Looks like spray paint! Would LOVE to know how this is done and with what paint. Amazing. Metro is great, but where Metro originally started (#424a) was previously site of ABC Hobby... who were huge on Kyosho in the early 1990s. You got a ScaleSeries Calsonic GTR32 too, huh? 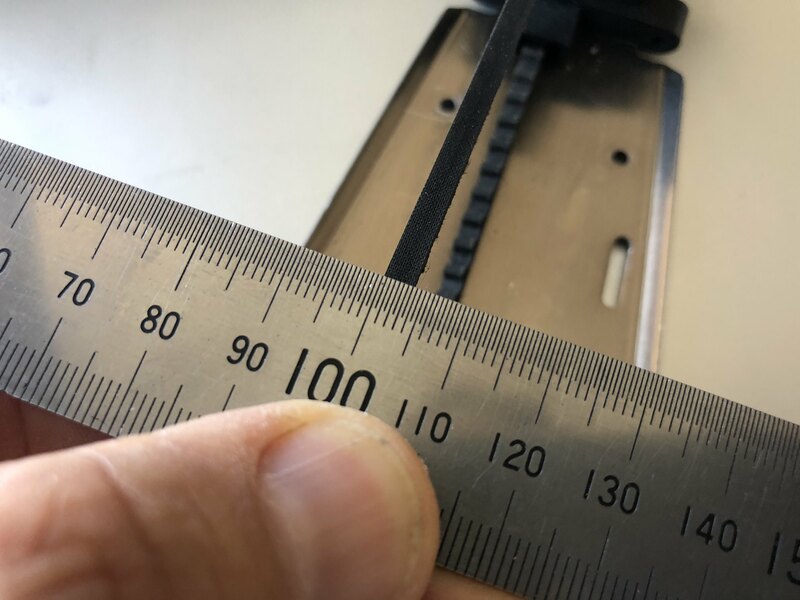 Rubber "timing" Belts are industrial commodity not made by Kyosho afaik. Count how many teeth on yours & they'll most likely be 3mm pitch as common in Japan. There's printing on the belt outside as to its specs but might've worn off by idler/tensioner. There were also a lot of aftermarket belts BiTD, made from Kevlar or aramid or nylon for lower drag/friction. Haven't seen much new ones of these lately. They come like that from factory afaik white painted WITH BITS MISSING it's been a while since Tomahawk landed, haven't looked at it again since to see if more paint has flaked off. dunno if somebody tinted the ones on the Scorpions, looks yellower than usual white. Might be just camera white balance being off. Has the Calsonic body. I made a bumper when the original broke and took the Optima mid shocks and steering, which have now all come back off! Would be AMAZING if they are. I've been slowly accumulating bits to restore mine, nearly 20yrs haha. Isn't the nitro car also part of ScaleSeries? There's electric 4WD (Mid based) and electric 2WD (Ultima based), before they went to that modular chassis. God in the very expensive hunt and purchase of parts, I have now stumbled upon these old block tires that stopped being produced from what I can tell in 2014? 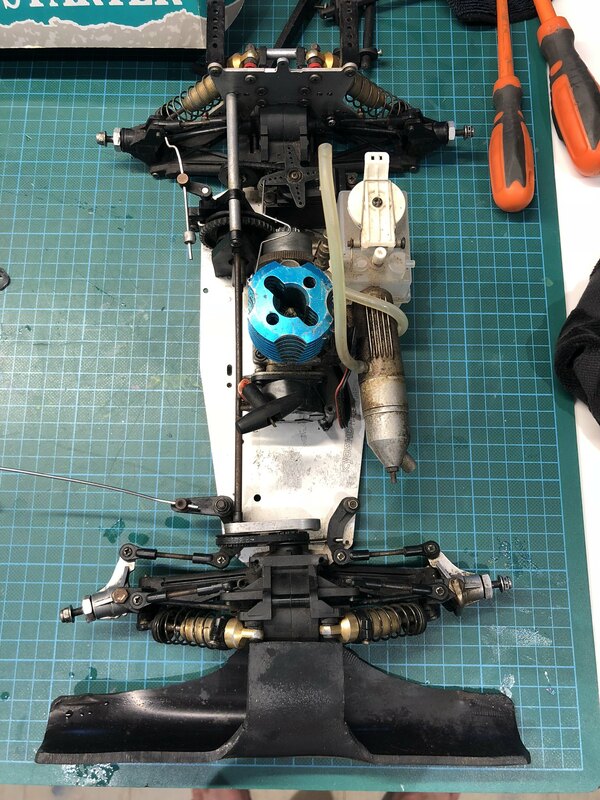 They look like faithful re-productions of what all us Kyosho fans want, anyone have any information on them? 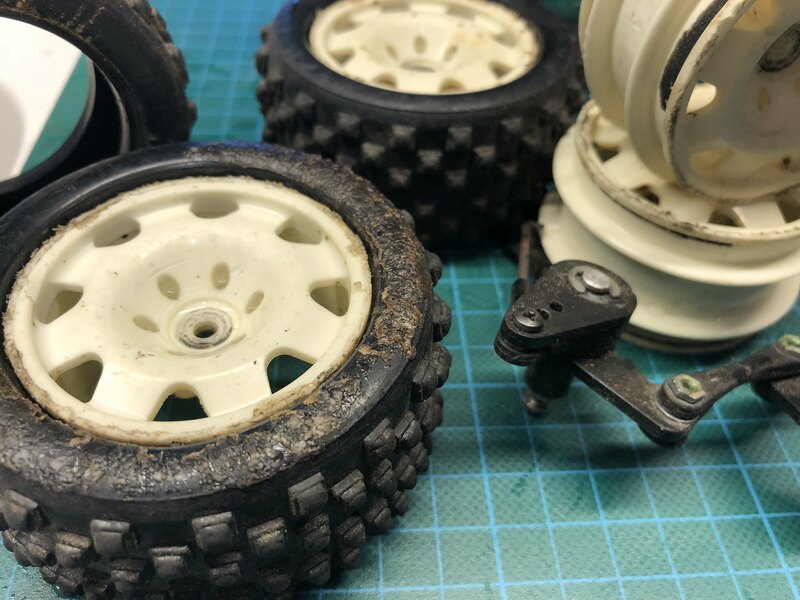 Trouble with the Kyosho re-res, they're not like Tamiya re-res where parts will retrofit... Kyosho is more a homage/recreation and only look the same - until compared side by side with original. And none of the new remade parts look same enough to restore it with. Same with chaindrive Optima... have a bitzer here missing a few bits, thought I'd try getting new bits from new Optima but they either don't look right &/or it's not easy to find sellers with stock of the bits I'm wanting... plus the bill seems to be totalling close to a whole Optima kit anyway so "why bother"
I didn't realise that parts weren't overly interchangeable until yesterday. I got a very nice note from the fella that runs the Optima House who is helping me with this project and he let me know that the OT-4 King Pins that fit into the aluminium knuckle arms that look identical to the re-re Optima aluminium knuckle arms, in fact, have a different hole size so you can't use them if you want to use the original kingpins. I have however decided to buy them regardless as the price is far too good! The price I am now up to already is in the ballpark of a new buggy, which is distressing but also in the category of "whatever" as I'm having fun doing it. I'm keeping a detailed list of parts, suppliers and costs so that I can put it on here when done so others may benefit. The way I'm doing it is far more painful than others would do it, but it'll save a bit of money as I'm dealing with a lot of different suppliers to yield the best result to cost ratio! 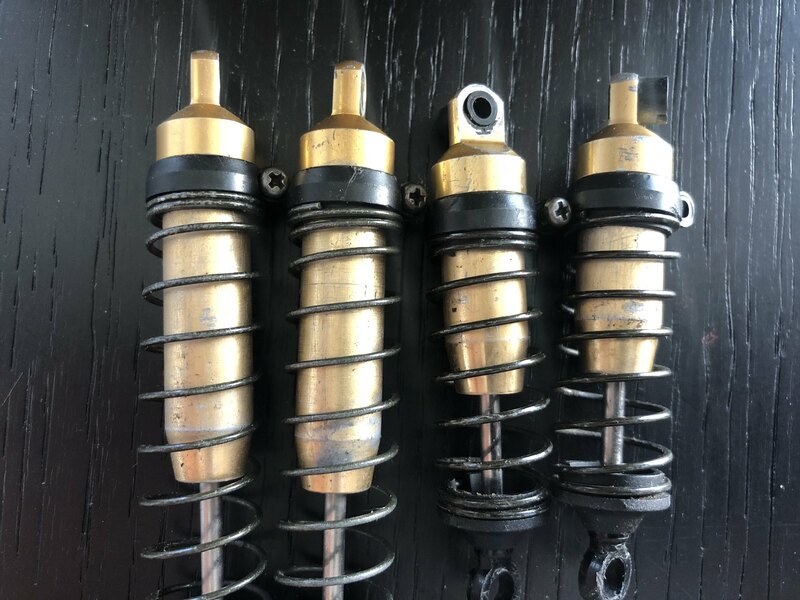 Anyone ever re-anodised their gold shocks? It feels like a risky move (colour matching, thread issues blah blah) but man mine look tired and thrashed. Also the actual springs look terrible... Can you spray them or is that futile? Restored new anodised chassis.... be very curious if anyone's done that! Seems far less risky than the shocks.